Today is July 4th, also known as "Independance day" in the US, and since I have a lot of visitors from North America, I thought of celebrating it on PDP! I found out that there is a "July street" (rue de Juillet) in the 20th arrondissement of Paris, so today I went there and planted my camera just in front of... number 4 (click in the photo to enlarge it)! I know it's not the finest photo I've taken, but it's just for the fun ;-) Happy 4th my dear American visitors. Thanks, a lot, Eric - especially for making such an effort - very cute! Can't wait to see what you post for your 14th! Happy 4th to all in the U.S.! Thanks, Eric. And, of course, we thank the French for helping us win our Independence. Vive Lafayette! Vive La France! Thank you, Eric! The things you do for us. Happy Fourth to all the U.S. PDPers. Vive Lafayette! Vive La France! Very cool photo and I adore the story behind it. The sentiment is wonderful, Eric, so thank you! And the picture is cool--sort of bleak but not in an awful way. The windows are either barred or tired looking, even the one that is open and you look into black. It has an interesting feel. I am wearing a French flag lapel pin today - proudly. @ M Johns. You should save that for Bastille day in 10 days! Merci Eric! Its very thoughtful- and very clever, too! 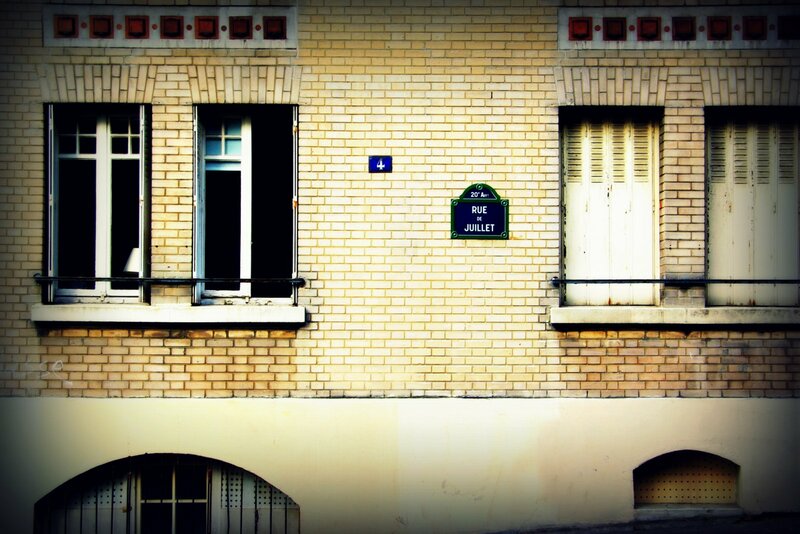 I wonder, is there a # 14 on rue de Juillet? ;) It does look like the photo 'had some work done' - but in this case to make it look older! Perhaps its natural, though - I've had some weird and amazing results that looked manufactured, but weren't. Aww Lois, that's cute - your firecracker baby - happy birthday to her. So...... Vive la France! Vive Lafayette! And Vive le Tour, too! Allez, allez!!!! Can't wait for the fireworks!! One day, I'll make a book called "the secrets of ParisDailyPhoto" where I'll show backstage! Thanks, Eric! We'll set off some fireworks for you tonight. Lois -- Happy birthday to your daughter—and I'll bet she really IS a firecracker (just like her maman)! This is delightful, Eric, merci! thank you...merci...i love the picture...fixated ont he doors and windows of paris and this photo has lots in addition to the sweet sentiment.....i check the photo everyday, rarely comment, but this one captivated me...so again, thanks! Merci Eric! It is that thoroughness of thought, that extra touch, that makes PDP one of my favorite daily destinations!! You are a treasure to all of us. - I very much miss Paris! Thank you so much, Eric, for your always creative and imaginative depictions! Perhaps later this month you might take a photo of rue 29-juillet in the 1st?! What a clever idea and we thank you E! Wow, that is really going out of your way, nice!